Hadi Rani ki baori is located in Toda Rai Singh.Toda Rai Singh is a historical city situated in Tonk district and was established in the year 1901. It is surrounded by hills and this ancient is of great archaeological significance. In earlier times it was known as Takshakpur, Takshakagadha, Todapattan, Ishtikapur, etc. it was founded by Nagas in the 4th Century A.D. and this town was ruled by Chauhans of Ajmer and Guhilas of Chatsu. In 15th and 16th century, this town was capital of Solanki Rajputs. The town got its present name from Rai Singh Sisodia who was the famous ruler of this place. During the reign of Shah Jahan, he was a Mughal mansabdar. Toda Rai Singh is blessed with rich cultural heritage and glorious historical past. There are many historical places of tourist interest in Toda Rai Singh such as- Ruti rani Mahal, Gadh k Balaji, Neem ki Khan, Budh Sagar, Am Sagar, Hadi Rani ki Baori, Raja Rai Singh’s Mahal, Isar Baori and Bhopat Baori. The temples of Raghoraji, Govind Deo Ji, Gopi Nath Ji, and Kalyanji are also popular. Hadi Rani is known for her legendary character. She was a daughter of Hada Rajput and was married to a Chieftain Chundawat of Salumbar in Mewar. Hadi Rani sacrificed her life only to motivate her husband to go the war. In the year 1653-1680 a battle was fought between Maharaja of Mewar and Aurangzeb. Maharaja of Mewar called her husband for the war. But the Sardar hesitated about going to war as he was married only a few days earlier. However, being a Rajput and to protect the Rajput honour he had to join the battle and he asked Hadi Rani to give him some memento to take with to the battlefield. Hadi Rani thought that she was an obstacle to his husband in completing his duty for Mewar of being a Rajput. So, to motivate her husband to go the war and protect Mewar, she ordered her head to be severed and presented to her husband. On seeing the head of his beloved Hadi Rani, the Sardar shattered but then tied her head proudly as a memento around his neck by its hair. He fought bravely in the battlefield and made the forces of Aurangzeb to run but even after the victory he refused to go from the battlefield and he cut his neck too as he didn’t want to live anymore. The women of Rajasthan have always been known for their love for the motherland and their extraordinary courage. When it comes to their lives for the honour and loyalty, uncompromising they were ready to sacrifice their lives to uphold these virtues. Hadi Rani inspired her wavering husband to fulfill is duty by going to the battlefield and to save Mewar by sacrificing her head to her husband as a departing gift. To give honor to brave Hadi Rani, baori is built in her name in Toda Rai Singh, in the Tonk district. Baori also called Stepwells or bawdi, or vaav. These are wells or ponds in which the water may be reached by descending a set of steps. Deep trenches into the earth were built by the builders for dependable and year-round groundwater. Walls of these trenches are lined up with blocks of stone, without mortar, and stairs were made which reaches down to the water. This Baori is a major part of Toda Rai Singh which one must see while visiting this place. The traditional architecture of this baori, when seen from a distance, makes this place a must-visit. The Baori has unique features in it as there is no symmetry in the design and many more. The steps are built in such a way that it will collect the water. The steps looks crazy almost like waves rolling down the hill side. This Baori is also used for shooting movie as it is an adventurous site. The scenes of Rani Mukherjee’s movie “Paheli” was filmed at the same Baori. Because of the movie shots, this Baori has become a best place for hangs out. In a step well, there are some ornamental and architectural features which are mostly associated with dwellings and other rural areas. 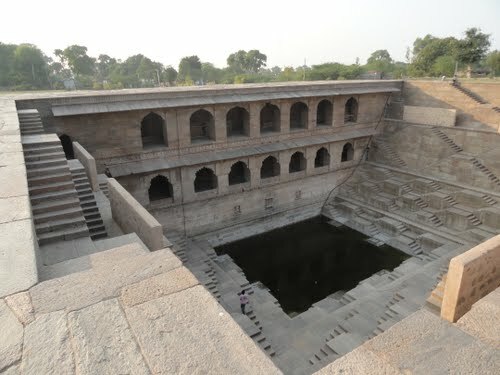 Baori is usually divided into two parts: a vertical shaft from where water is drawn out and the inclined stairways which provides access to the well. The walls of the surroundings are carved out in such a way that the water remains cool during hot summers.